A companion dashboard app for the F1 2016, 2017, 2018 and Forza Motorsport 7 games which recreates a race car dash and displays live telemetry data from the game to add depth and realism to your sim racing. This second-screen app adds to your immersion in the game. Display key data such as speed, gear, RPM, fuel level, ERS, laptime and lap delta. The RPM lights are customisable to suit your preference and the whole display can flash at the gear shift point. A simple dashboard is included with numerous other layouts and styles available as add-ons. Please note that some add-on dashboards are only suitable for certain games. Customisation options includes 'backlight' colour, and speed, pressure, temperature units. Add up to 10 dashboards to your selection at any one time (per game) and quickly swipe between them for fast access. F1 2018 allows for the dashboard switching to be done from the controller/steering wheel. 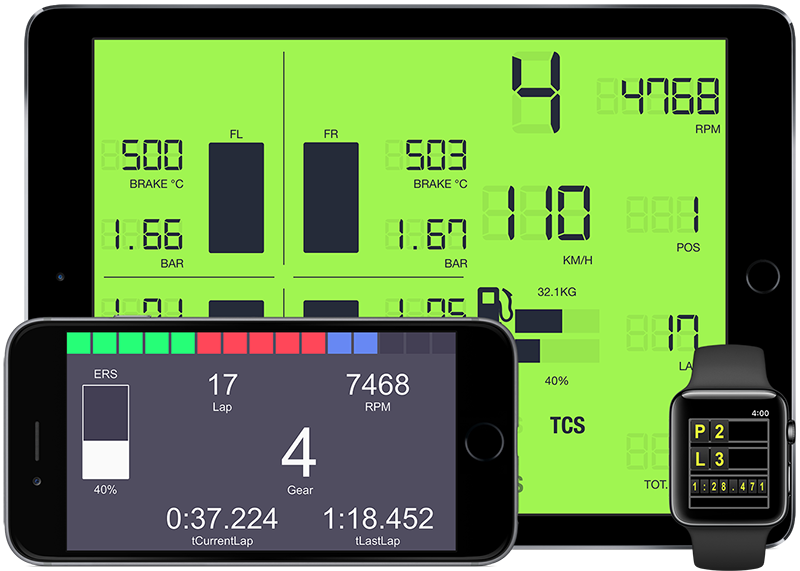 Laptime and fuel usage history are available on a popup screen on the LCD dashboards to help with those long practice sessions. The F1 2016, F1 2017 or F1 2018 games are required on either PC, PS4 or Xbox One, or Forza Motorsport 7 on PC or Xbox One. This app requires the UDP telemetry mode to be enabled in the game - instructions for enabling this are provided. by Mr green 665 The best on IOS! I have used this for about a month now and it just keeps getting better and better. My only complaint I had before was that your racing name was unknown however after this most recent update as well as asking them, they added in the ability to personalise the app! It’s a must buy and works so well. Incredible! I am using f1 2017 Xbox one. Amazing realtime.